Earn CE credit with these certified educational activities based on presentations from JADPRO Live at APSHO 2018. Access the full-length video presentation, the slide deck, transcript, and the entire lecture as a podcast. You can earn CE for each of these activities by following the links. Click on any of the video presentations below to get started! This activity is supported by educational grants from AstraZeneca and Genentech. 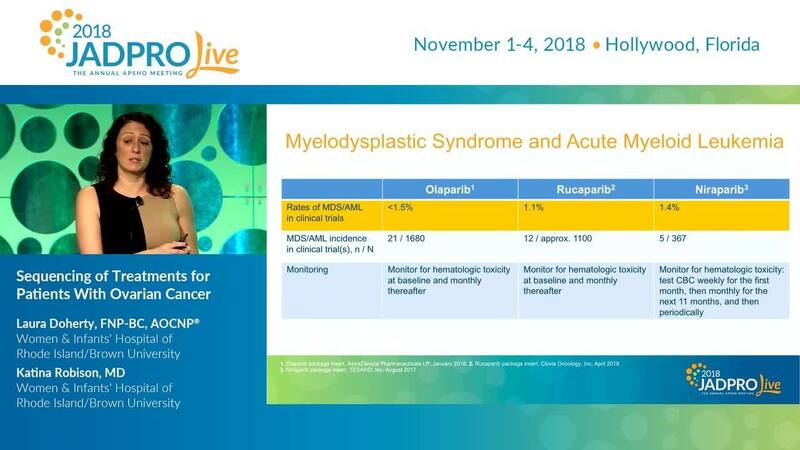 Take a deep dive into the history of ovarian cancer treatment, evaluate current options for first-line and maintenance therapy, and review safety and efficacy data for PARP inhibitors alone and in combination with immunotherapy or anti-angiogenic agents. Center for Health Sciences website.